Chimichurri can be used on grilled steaks, steamed vegetables, tofu, fish, chicken and even pasta. 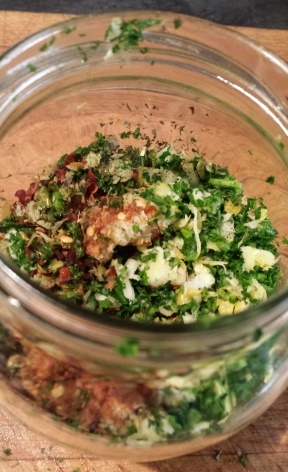 Put herbs, spices, and garlic in the food processor and pulse until chopped. With motor running, slowly pour the olive oil in a thin stream, then add the vinegar and process until smooth and emulsified.